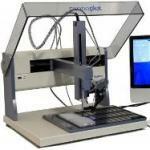 SonoPlot offers a precision picoliter fluid dispensing solution called GIX Microplotter II. 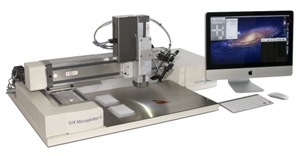 The system is suitable for the microarray and polymer electronics markets. The dispenser is a core of the Microplotter that employs controlled ultrasonics to deposit fluid in a noncontact way. This sophisticated technology can create picoliter droplets that draw features on a surface as small as 5µm. Saturated solutions or viscous fluids can be deposited easily with the GIX Microplotter II system. Moreover, the ultrasonic pumping action serves as an efficient cleaning mechanism and helps in depositing many solutions quickly and sequentially.